After 8 years of dividend investing and $70,456 in dividend earned during that period, I have grown as an investor and I have had some learnings along the way. I would argue that it is practically impossible to start investing early and have all of the knowledge at hand. My children, for example, are already investors through Computershare and are starting to learn the ropes but still lack a lot of the necessary skills to select a stock or manage a portfolio. I have many discussions with them and fail to teach investing very regularly. I won’t give up and will continue to find ways to make compound growth simpler to understand as well as explain risk management or emotional fear from risk. The point I am trying to make is that all investors need to learn the ropes and get better with experience. The journey differs for everyone but we are all investing in the same stock market. In the 4th learning, I share my dividend earnings since I started tracking my dividend and performance back in 2010. You can assume the dividend yield on average is 2.5% if you want to reverse engineer my total dividend portfolio value. Some of the learnings may be obvious to a seasoned investor but we all have to start somewhere…In the spirit of helping overs avoiding the same mistakes, here are 5 learnings. These were my learnings through my journey and they have helped me define my investing rules. Outside of REITs, rarely will a high yield stock maintain the dividend yield through all economic cycles. It means you have to pay attention to your holdings and their business very closely. It’s not a “buy and hold” situation like other dividend blue chip stocks. I was a little naive back in 2009 when I started with dividend investing and realized that high yield stocks were not really helping me grow my wealth. Sure, I was getting a yield better than bonds or GICs but that was it. I was missing the growth part of a strong company. There is a couple of ways to look at high yield stocks. The first is to simply look at any stocks paying more than 6%. The second is to look at the yield against the sector. Investing Rule: Set a dividend yield range for each sector that you find acceptable and stick to it. Compare apples with apples and oranges with oranges. Comparing the dividend payout ratio of an energy stock with a technology stock will usually lead to the same conclusion. The dividend payout ratio from the energy stock will be high and the technology stock will be lower. It’s simply the nature of their business. Learn how sectors operate to compare the right metrics. In the financial world, analysts, who review companies, stick to a sector or even an industry. There is an amazing breakdown of the sectors and industry on Wikipedia called Global Industry Classification Standard. You will find a large table breaking down the 4 groups below. Investing Rule: Compare your stock selection to the other players in the sector before making the trade. You will be inundated with best of X stocks or now is the time to buy X or any other media comments that will cause you to review your holdings. Writing down your strategy means that you will focus on it and ensure your holdings are matching your strategy and leaving your emotions at the door. You can adjust your strategy as you learn more but don’t make emotional trades. If you are a dividend investor, will you ever hold non-dividend stocks? If so, what’s the percentage? Write it down and be accountable. Here are some questions to help you define your strategy and your investing rules. What is your stock selection strategy? Growth? Income? Blended? What metrics matter to you? I see some relying on debt balance while others focus on yield or even the P/E. Often times, they are proxy to valuation when including a historical comparison. What is your sell trigger? 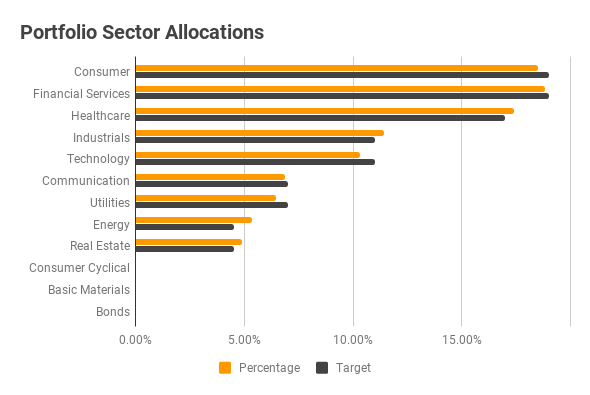 What is your sector diversification strategy? Or country diversification approach? Or income vs growth? Investment Rule: Write your investing strategy and rules down. Make it a check it and use it when making trades or reviewing your portfolio. Have a quarterly review to decide on bigger changes. I stumbled upon two concepts some years ago that have helped me focus on dividend growth even if the dividend yield is below 2%. Concept #1 – An investment firm interview on Business News Network said they only looked to hold dividend stocks with a 10% dividend growth rate over 10 years. The concept had me intrigued and I started assessing which stocks would fit the criteria and really liked the concept. Concept #2 – I read about the Chowder Rule and the concept resonated with me and my strategy. I found the relationship between dividend growth and dividend yield to be a great indicator when all other variables are within acceptable range. The Chowder Score for estimating total returns is the easiest way to approximate your return. No need for some fancy formula with multiple hypothesis. See below what compound growth has done for my portfolio in the last few years. Early on, I had some high dividend yield stocks and as I learned about dividend growth and total returns, I started shifting my portfolio and saw the compound growth in action. I also started to focus on 10 years of dividend growth as a minimum criterion to assess the company’s desire to grow dividends. Investing Rule: Does dividend growth matters to you and if so, what rate do you find acceptable? If you want to learn from your mistakes and understand where you are going, you will need a compass. I have always tracked my finances. From the early days with Quicken tracking all expenses on my PC to now tracking only my investment portfolio using GoogleSheet as a portfolio and dividend tracker. There are a few tracking characteristics that grew in importance over the years. Characteristic #1 – The dividend income earned as a way to know I am making progress towards the ultimate goal of covering my expenses with my dividend income. Characteristic #2 – A diversification meter to understand my individual company exposure across multiple stocks to my diversification across sectors. I use it to understand which sector is out of favor and add to it. It’s a borrowed concept from index investing (or at least that’s where I learned it). Characteristic #3 – A proper performance metric. I still don’t trust the calculation from my discount broker and prefer to rely on the XIRR Excel formula and my account contribution timeline. I can easily aggregate the accounts I want to see together or separate. As a bonus, with Google Sheet, I can easily compare it to any indexes for comparison. What I really love with Google Sheet is that I can use historical prices to simulate purchasing shares from an index and compare the ROR against my own portfolio. Investing Rule: Religiously track my investment transaction and stock details with graphs for ratios. If you don’t know, how are you able to make effective decisions?